A Good Soup Attracts Chairs bridges cultures on each side of the Atlantic through the ethnic cooking of the African nation of Ghana. One of the best ways to teach children about their world neighbors is to introduce them to a common point of both cultures—food. 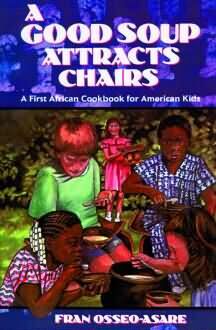 This new children’s book helps church groups, slumber parties, scout troops, classrooms, or families build a special relationship with the children of another continent through easy-to-supervise recipes for traditional African dishes. Drinks, desserts, and main dishes are just some of the recipes available in this book. The menu includes some familiar dishes like Corned Beef Stew and Rice and Beans; but for a true adventure, readers should sample Gari Foto, Egg Curry, Banku and Kenkey, or African Doughnuts. The thirty-seven recipes come with instructions and safety tips for hassle-free cooking, so parents can join in the fun. Basic cooking tips are covered as well as the special African techniques. There are also hints for cooking from scratch and using available substitutes. Fran Osseo-Asare is the wife of a Ghanaian national. While visiting Ghana on her own and with her husband, she lived among the Ghanaians and learned the ways of the kitchen from her African friends and family. She credits the ease of recreating the recipes to her husband’s guiding knowledge and the assistance of her three children.